Angered over loss of his position, Elkin declined to attend vote to appoint Gilad Erdan Internal Security and Strategic Affairs Minister. As an act of protest, Strategic Affairs and Absorption Minister Ze'ev Elkin (Likud) announced Monday afternoon that he would refrain from attending the vote on appointing fellow Likud MK Gilad Erdan a minister. According to the deal Erdan and Prime Minister Binyamin Netanyahu have threshed out, the former interior minister will be made Internal Security Minister and Minister for Strategic Affairs or Hasbarah (Public Information) - effectively taking the position away from Elkin. Erdan has also been promised a sizable increase in the Internal Security Ministry's budget. In an additional demonstration of his anger, Elkin threatened not to attend a vote Monday evening on an amendment to the Basic Law which would enable budgets to be doled out twice a year. "How would you expect a minister to react when he is being fired? 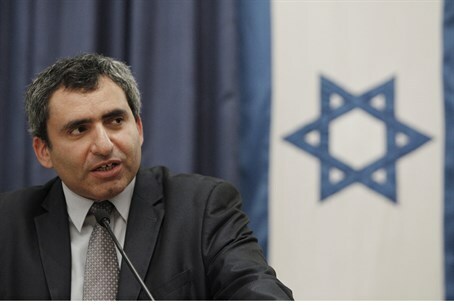 I'll react as a minister who gets fired," Elkin told Haaretz when asked about the situation. Elkin is likely not the only Likud MK fuming over Erdan's expected appointment. Political analysts have surmised that with Erdan's entry into the government, Minister without Portfolio Benny Begin will resign in accordance with Netanyahu's desire to avoid increasing the size of the cabinet. Begin will continue to serve as one of Likud's Knesset members.